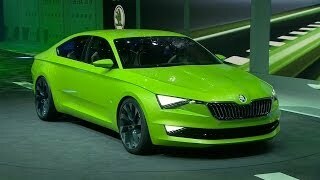 It has been time that we haven’t seen any change in Skoda’s design language but finally with the unveil of Skoda VisionC Concept 2014 at the Geneva Motor Show, it looks like that the automaker has finally something in his box to present. The first look of this concept 2014 will undoubtedly take you o the gleam company has for its future models. 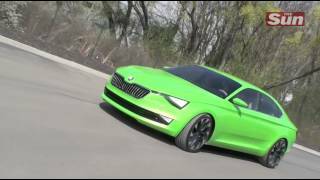 Let us have a closer look at the review of Skoda VisionC Concept 2014 and get to know about it in detail. Interior of Skoda VisionC Concept 2014 is elegant and comfortable with flawless expression of company’s vision for its future models. Inside Skoda VisionC Concept you’ll find sufficient space adding badges to your comfort zone. To keep the drive in control and all informed, driver can find his controls and instruments placed right in his approach and well arranged. A touch sensitive multimedia screen is placed at the center of dashboard making your entertainment smooth and swift. For the interior of Skoda VisionC Concept 2014, company has also integrated lighting at various parts to enhance your experience inside. The rear passengers get air-outlets which can be adjusted keeping individual priority in mind while the headrests can be retracted in backrests when not in use and thus making the rear view more clear. Another interesting inclusion at the back is through reading lamps integrated in rear doors. Exterior of Skoda VisionC Concept 2014 is elegant and futuristic. Starting with the front fascia of Skoda VisionC Concept you have a broad radiator grille amidst the new triangular designed headlights. Beneath them are fog lamps on each side carrying the same design pattern as that of headlamps and thus spreading aggression through four-eyed front fascia. Moving towards the rear fascia of Skoda VisionC Concept the surprising design language continues with 3D design. Topping the notch again are the distinct taillights in C-shape making their way into the bumper. The entire lighting function at the rear end creates the unique image of exterior of Skoda VisionC Concept 2014 and thus gives your expectations for company’s future design language a new milestone. 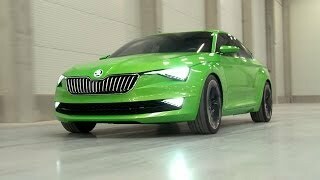 The Skoda VisionC Concept 2014 hides beneath its hood a 1.4 Liter TSI turbo engine claimed to reach top speed of 133 mph, looking at this figure it can be expected that the production model might come with around 125 hp. However there is no reveal regarding total output of Skoda VisionC Concept 2014 from the company. As of now all we can do is, wait for the next update Skoda shares for its brilliant futuristic concept.